Does your team need to achieve the impossible? Does your business needs to step of its comfort zone to reach a new level? "The Moonshot Effect: Disrupting Business as Usual" offers a unique path for your business to innovate fast and upgrade your team at a furious pace. This book gives business leaders and project managers the map through the process using the same principles that helped America land a man on the moon. There are work projects and then there are projects that transform everything. We might dream of working on a world-transforming project but the closest we’ll get to a big and potentially world-transforming project is by reading about them in a Forbes magazine. Have you ever asked why? Have you ever wondered what a powerful project could do to your business? 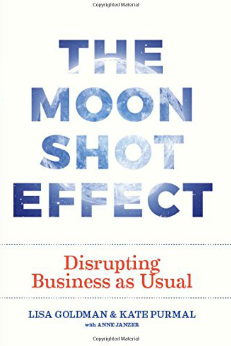 The Moonshot Effect: Disrupting Business as Usual dares readers to think about this very concept and guides them through the process of successfully landing on the finish line. What is The Moonshot Effect About? There are moments when teams exceed expectations within an amazingly short deadline. One example, which serves as the chief metaphor of the book, was the landing of man on the moon. Under an unexpectedly quick deadline, America (in particular, NASA) was able to transform President Kennedy’s words “We choose to go to the moon …” to reality. The culmination of a quiet deadline, intense focus on a single project and a desire to break expectations were three key factors behind that successful walk on the moon. Those same factors, however, don’t just help nations get to the moon. They can be leveraged by any business that is willing to embrace “moonshot” projects (ambitious projects done under extremely tight deadlines aimed at achieving or developing something unique). The trouble is most businesses don’t engage in these kinds of projects on purpose. Most business projects are focused on the status quo, hitting the next sales target or getting that next customer. They continue on cruise control until something forces them out of their comfort zone. Waiting for a reason to move your business out of its comfort zone is a dangerous strategy in this age of constant disruption. While Myspace and Blockbuster were resting on their laurels, Netflix and Facebook were in the background developing a faster and cheaper competitive product. Maintaining a competitive edge and raising teamwork to a new level are some of the reasons the authors of “The Moonshot Effect” wants readers to step out of their comfort zone. Even if they don’t make interstellar spacecraft, they can create a product or service that takes them to new heights. Author Lisa Goldman is a management consultant and teacher who partnered with Kate Purmal, a C-suite level executive in charge of helping other executives reach their inspirational vision, to write The Moonshot Effect. What Was Best About The Moonshot Effect? The Moonshot Effect offers an almost immediate solution for businesses that want to innovate, but want to engage in a short-term project before diving fully into the innovative process. A “moonshot” project may offer the perfect opportunity to test and experiment with the work needed for innovative breakthroughs. But such a project doesn’t necessarily require a complete overhaul of a business. The book provides an excellent outline for leaders to navigate as they plan and work through the issues of embarking on such a project. Because of the broad nature of “moonshot” projects, The Moonshot Effect does not offer a specific to-do list that leaders can just follow in order to make a breakthrough. Instead, it provides the key principles and tips to keep in mind while engaging in the project. The book does provide two key case studies (Alcoa’s “zero accidents” initiative and GE’s Ecomagination initiatives) which give a broad vision of what a “moonshot” project looks like. Additional details, however, on topics like budgeting and narrowing down a specific (but realistic) goal could help readers who need more specific details to get started. Why Read The Moonshot Effect? The Moonshot Effect is best suited for leaders and project managers. For business leaders, the book offers a guide to a lower risk version of innovation that can offer high rewards. As mentioned above, if you want to get your business in the “innovation” game but don’t know where to start, a “moonshot” project might be a great way to start. For project managers, the book offers tips on how to navigate the dynamics of high-performing teamwork. If your project has an almost impossible deadline or lacks an urgency, making it a “moonshot” could be the ticket to higher efficiency. 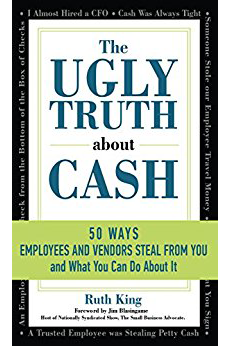 The Ugly Truth About Cash Sheds Light on How Employees Steal - and How You Can Stop It! I’ve heard great things on this book. I have to follow trends and be on top of all of it or my business will surely sink. Been reading Vaporized by Robert Trecek, roberttercek.com is his site with his info. It’s been a great help in learning how I can stay in the know with the tech sides of running by business.